iOS Development with Swift available now! Exciting news – after almost two years of work, iOS Development with Swift is now done, published, printed and available on Amazon or in a bookstore near you. 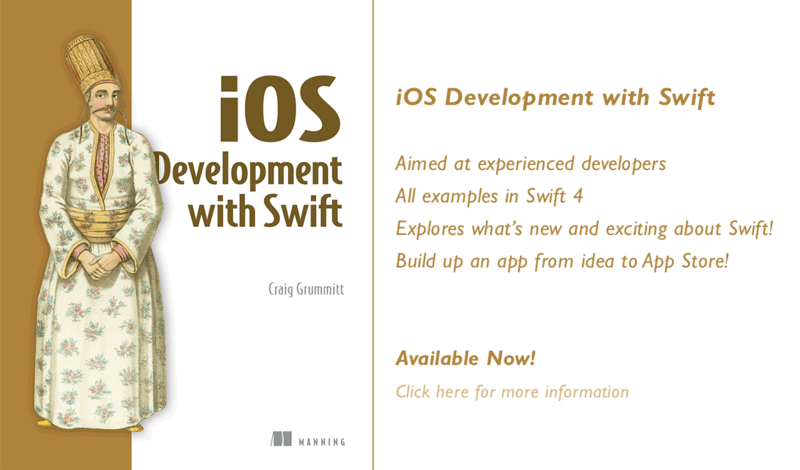 The book is aimed at experienced programmers looking to migrate into developing in iOS with Swift. It assumes no previous knowledge of Swift nor iOS but skips over all the stuff you’ll already know from your experience in other languages. How do you deal with different devices or orientations? What do you do if the keyboard pops up and covers the text field the user is editing? What are different ways of navigating between scenes? How do scenes communicate with each other? How can you integrate animation and adaptive layout? How can you handle background tasks? What are the different ways of storing data locally and in iCloud? What options are available for debugging in Xcode? I’m very much looking forward to seeing the apps that readers produce after exploring iOS development with the support of the book! Do let me know about your app creations via Twitter, and I’ll post them here! If you’re interested in taking a peek at iOS Development with Swift, you can check it out now as a live book using Manning’s online reader.